Katty: Do you like corn chowder? Lynn: You know if you like something, I don’t like it. You like smoked things; I don’t. You like cheeses I would never eat, like Brie. Katty: Um, OK. What don’t you like about corn chowder? Lynn: That there are no clams in it. This bit of comic diversion was brought to you by an old friend–someone who, like me, can’t help but speak the truth (and be funny!). I was beyond psyched to find native–yeah, real native, straight from Route 17 in Portland–butter ‘n sugar corn at one of my favorite farm stands, Q-P Market. 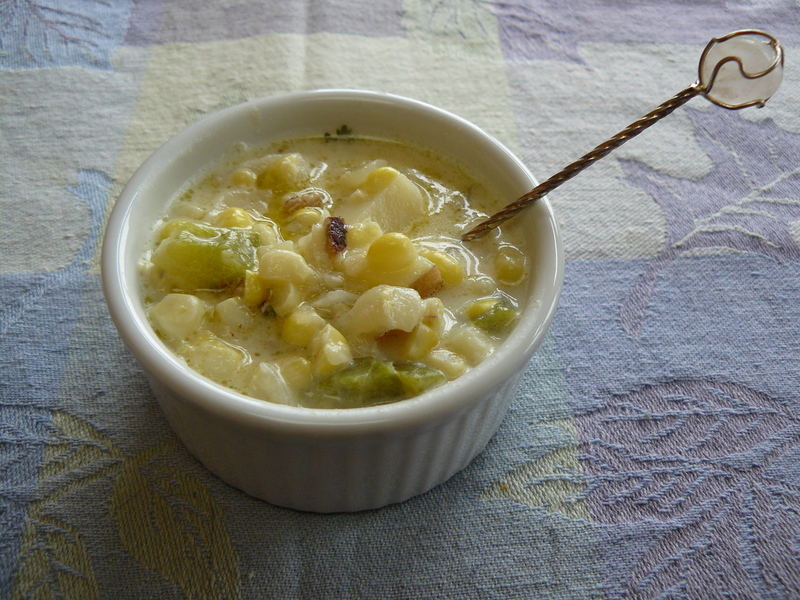 To showcase it, I decided to make corn chowder. What’s fun about soups is how simple it is to customize them–no rules, no science…it’s up to you! I used a classic Better Homes & Gardens recipe as a jump-off point, added a tip I learned from fellow Chowhound adamshoe last year along with some garlic, cilantro and cream and stirred up the following! I didn’t thicken it, but you can if you wish. My mom recommends thickening with cornstarch rather than flour. 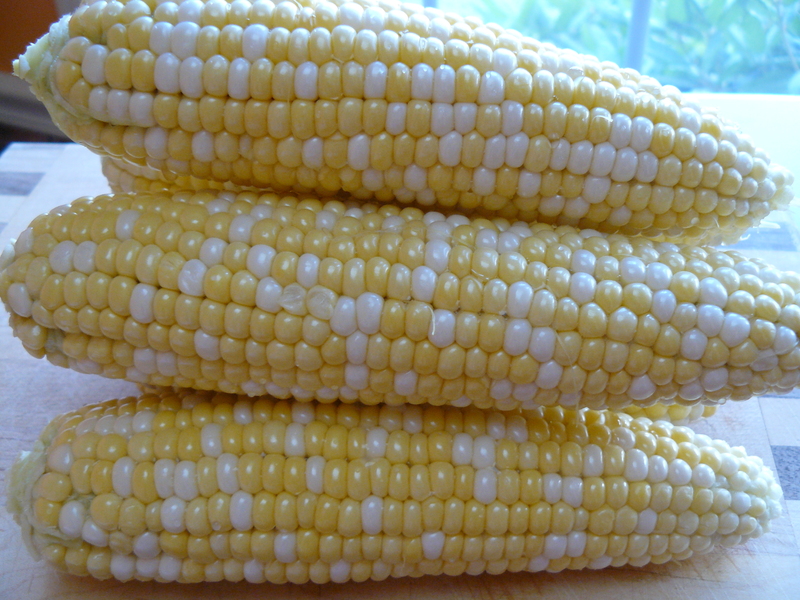 Cut kernels off cobs, set corn aside and save cobs! In a large stockpot, cook garlic onion and green pepper in hot oil till onion is tender, but not brown. 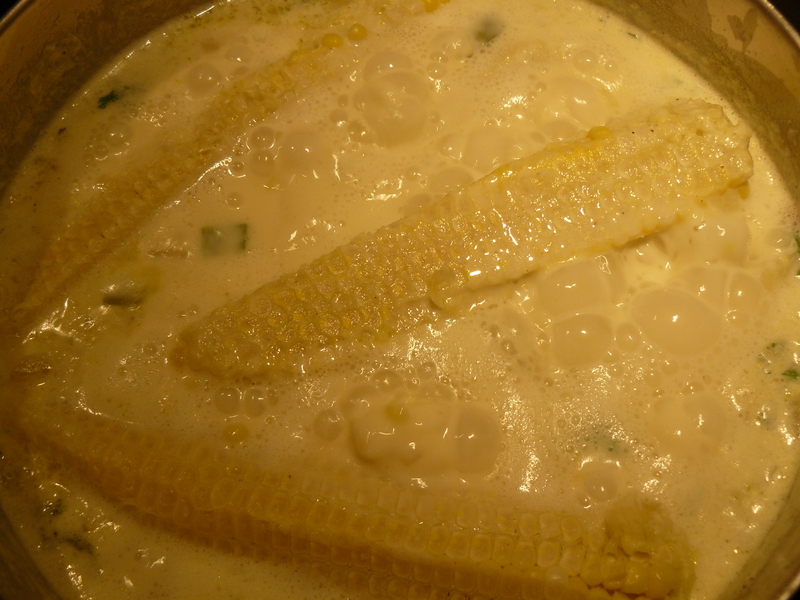 Add corn, broth, milk, potatoes and cobs. Bring to boil, reduce heat and simmer uncovered 10 to 15 minutes, or till potatoes are tender. Remove cobs. Add salt, pepper, heavy cream and crumbled bacon. Though there aren’t any clams in it, I hope you enjoy it! I have been since last week! Soup’s on! What are you waiting for? 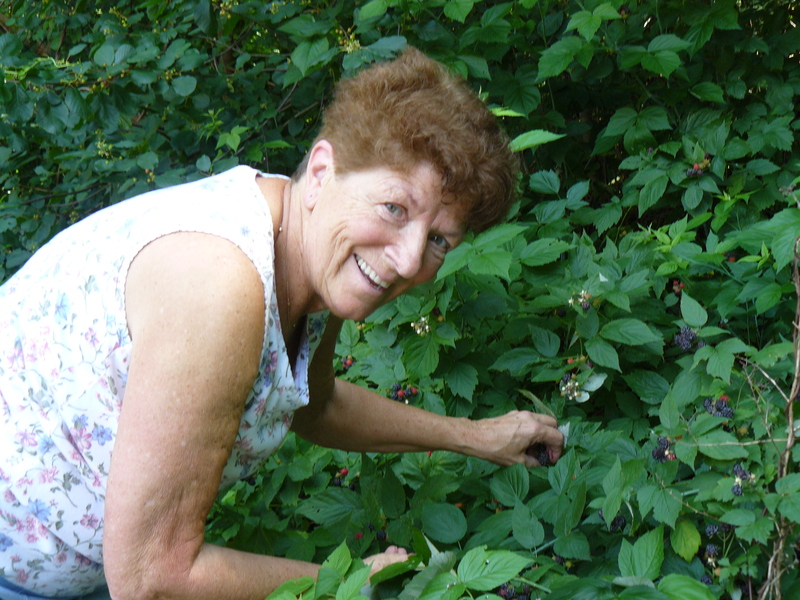 Just as I was ready to turn my cherry thoughts to blueberry thrills, I found my mom at the edge of the parking lot as she was waiting for me. What the heck was she doing? 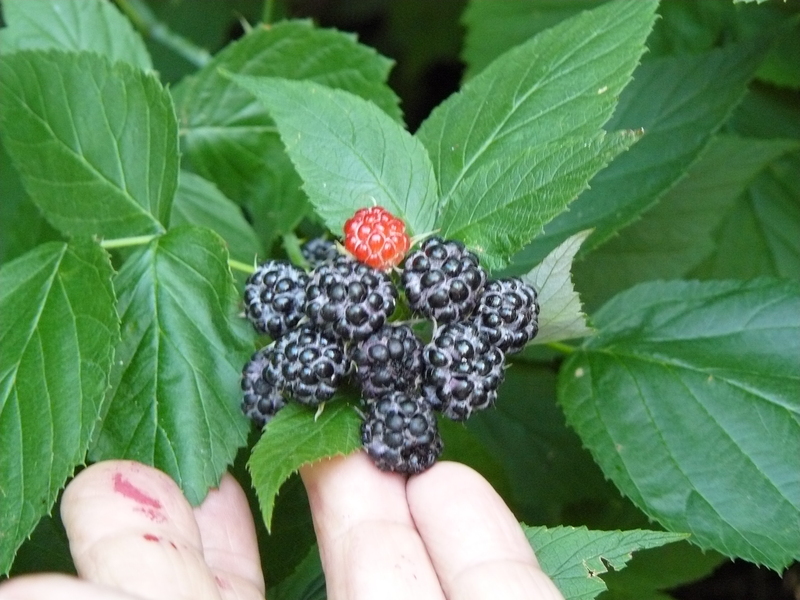 Picking wild black raspberries! BONUS! Free, found, fresh fruit! WOOHOO! Janey makes a fab free fruit find! 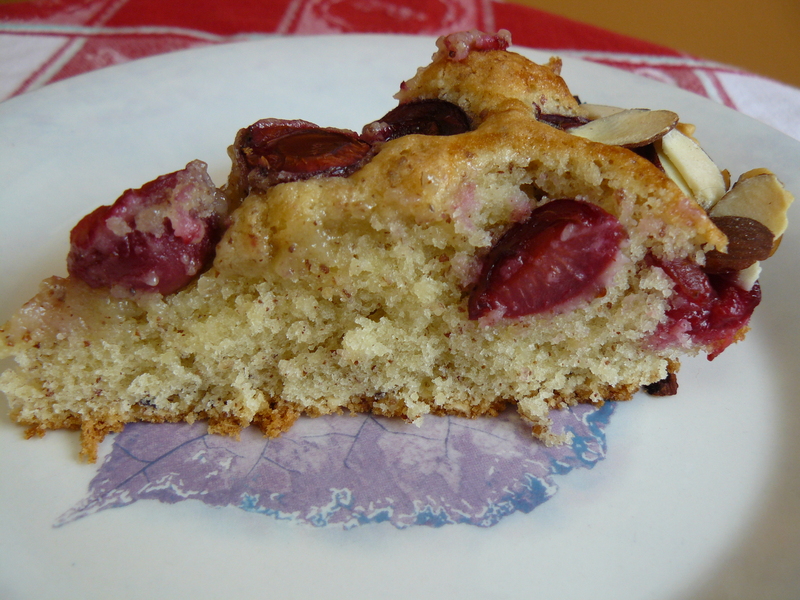 So, remember the Cherry Almond Cake from a week or so ago? 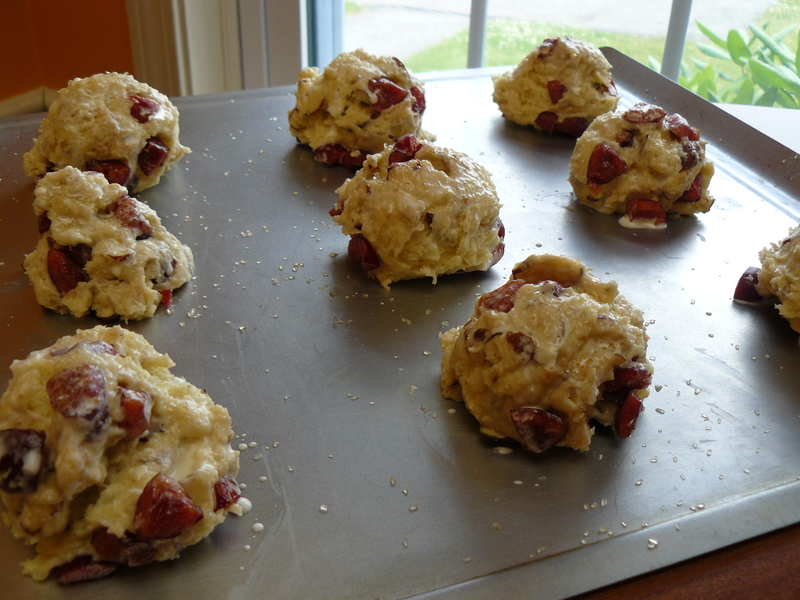 Let’s change it up with raspberries, swap the almonds for pecans, almond extract for vanilla and see what it’s like. And how ’bout a little cinnamon, too? Preheat oven to 350 degrees F. Butter a 10-inch pie plate. Using a mini food processor, add 3/4 cup pecans, flour, baking powder and salt. Process until pecans are finely ground. Set aside. Use your stand mixer to cream butter with sugar. Add eggs one by one, blending each one till fully incorporated. Add vanilla extract. With mixer on low, blend in flour mixture gradually–do not overmix. Spread batter evenly into buttered pie plate. 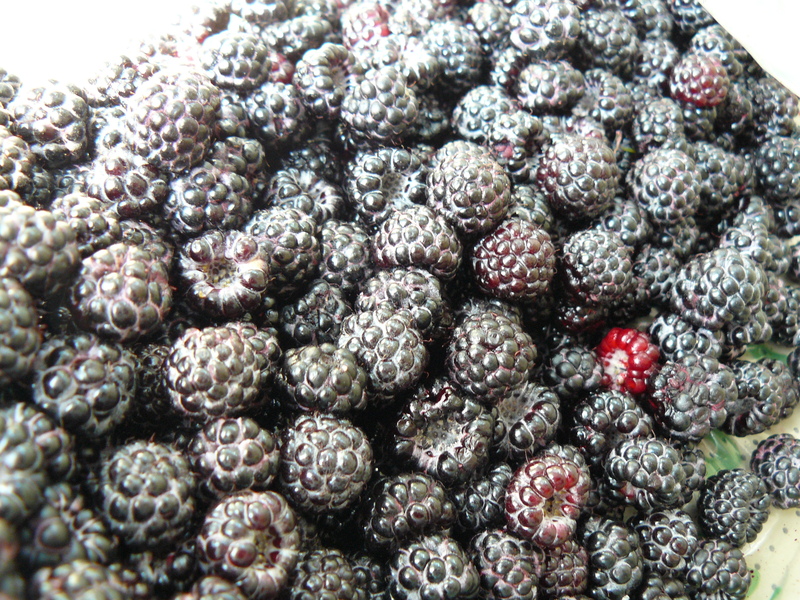 Place berries atop batter. Mix together remaining 1/4 cup of chopped pecans with 1 teaspoon turbinado sugar mixed with cinnamon–sprinkle around edges of cake, then all over the top for good measure. Bake until a toothpick inserted in the center of cake comes out clean, 45 to 50 minutes. Cool on wire rack. You’ll love it warm. Nom nom nom! Gimme, gimme, gimme that cake! A few weeks ago, I made my own biscuits for the first time. My mom noticed there’s not much difference between biscuits and scones by way of recipe–except biscuits call for melted butter vs. cutting in butter for scones. Cutting in butter seems fussy and not my style, so following my mom’s observation, I made very slight tweaks to the recipe my Foodbuzz friends posted. 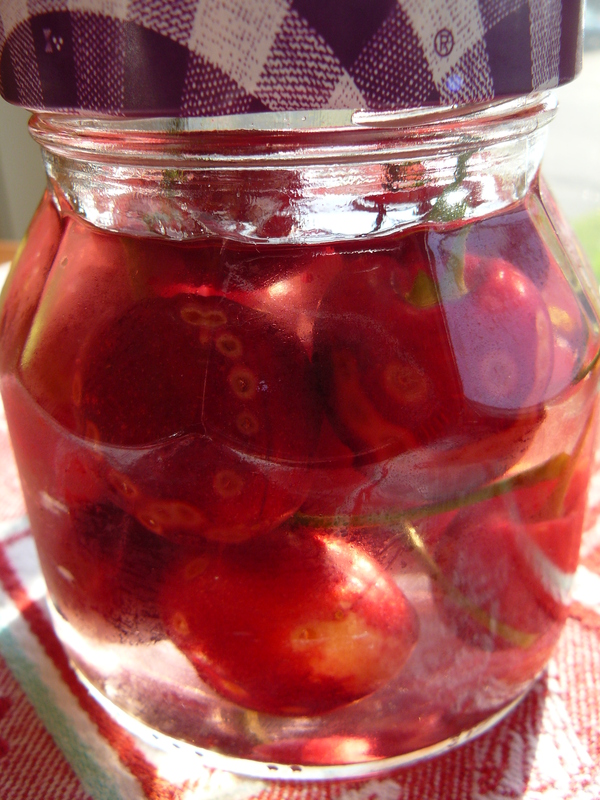 The ingredients are the same (except ½ cup fewer cherries, no salt, more extract), but the process is different. I’ve also added an almond glaze ’cause this kat rolls sweet. 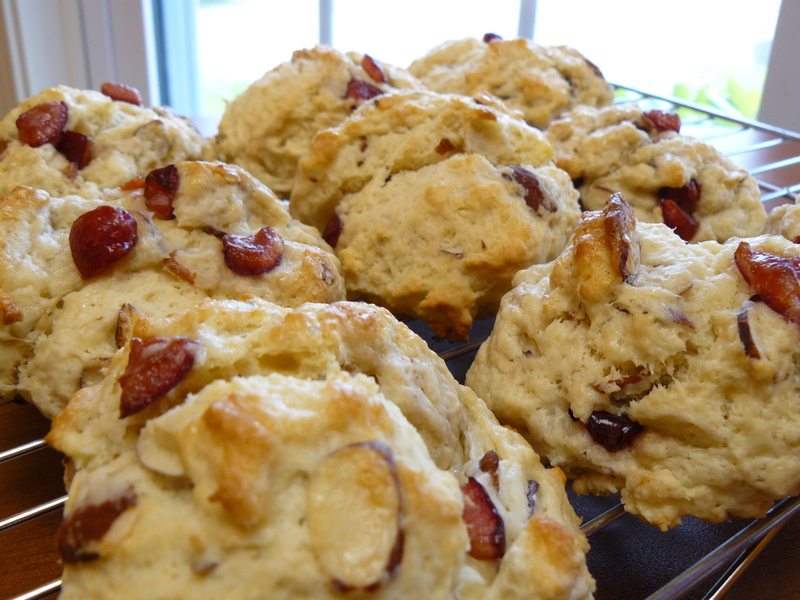 Consider these a lazy–katlike?–take on scones. Thanks for inspiring this one, CC Recipe! 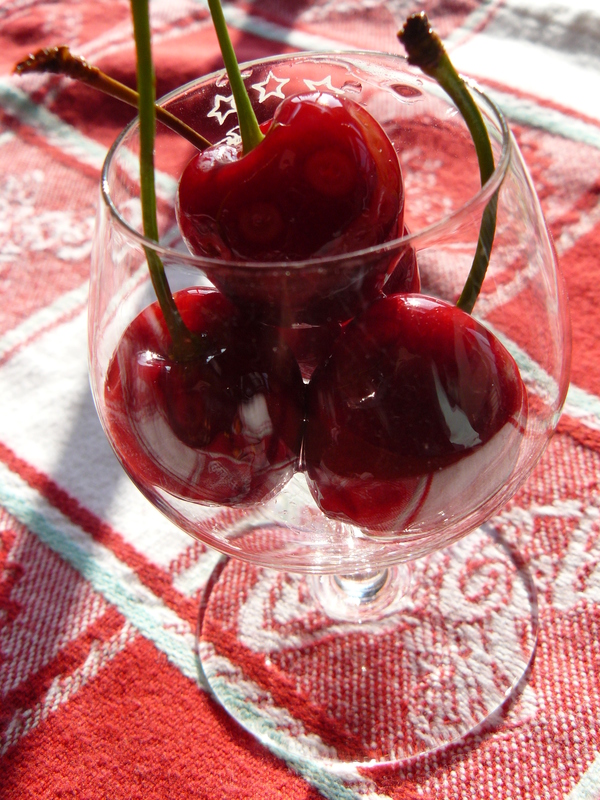 Continuing on my cherry kick after last week’s pickin’, here’s another tasty twist on cherries and almonds. Combine dry ingredients. Melt butter, beat egg separately. Add cream and almond extract to butter. Fold wet ingredients into dry ingredients. 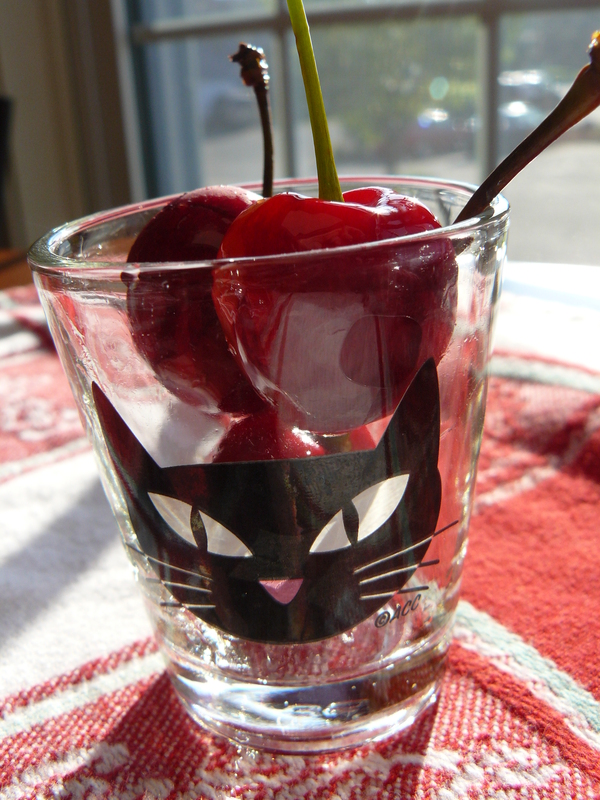 Add cherries. Use an ice cream scoop to portion the dough. 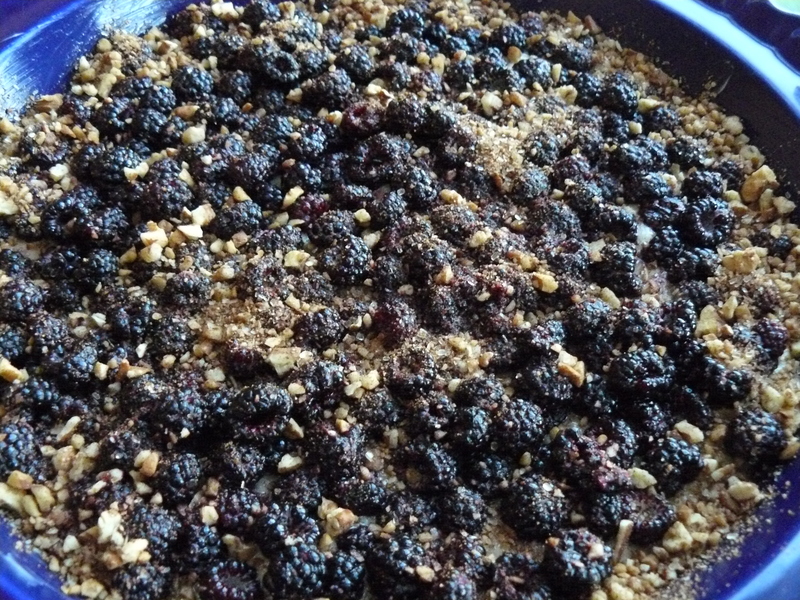 Brush tops with additional heavy cream, then sprinkle turbinado sugar. Bake for 12-15 minutes at 400 degrees F. Cool on baking rack. Drizzle with almond glaze. 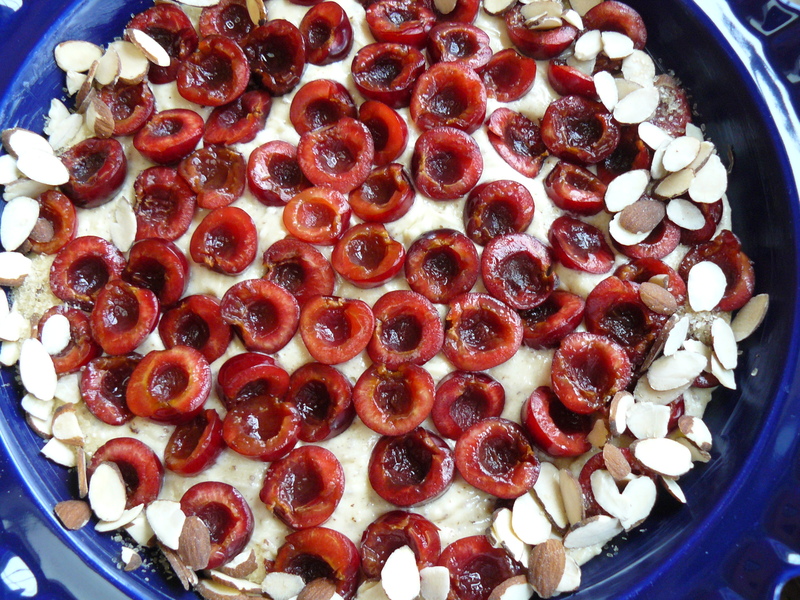 Cherry Almond Cake–from orchard to oven! 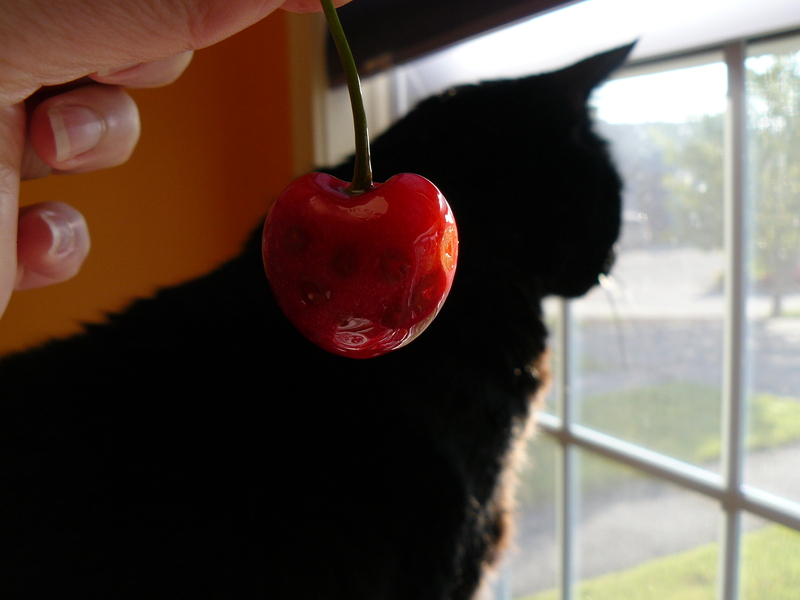 Cherries are ripe for the pickin’ in the Land of Steady Habits–didjaknow? Belltown Hill Orchards kicked off pick-your-own cherries yesterday, thus I hopped in the katmobile, headed for Glastonbury and grabbed a pail. I couldn’t leave Belltown without sampling their own cherry donuts…yes, made with freshly picked cherries right from their orchards! 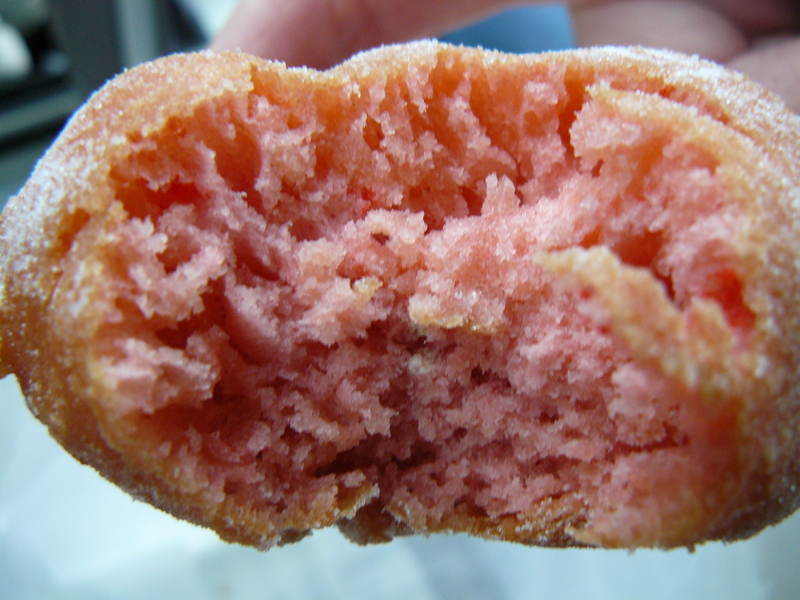 Belltown's cherry donut--have a bite! 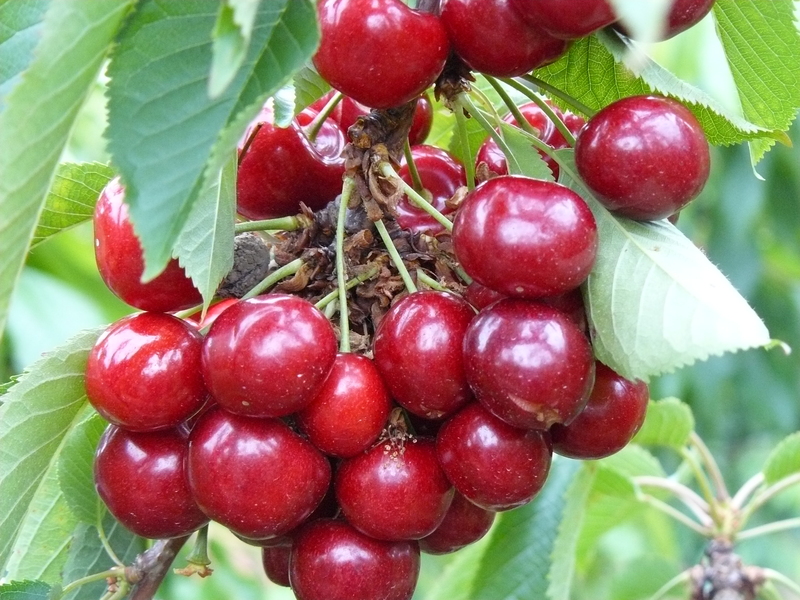 If you are anywhere near, please get there during cherry season to enjoy one yourself! Nowhere near me? 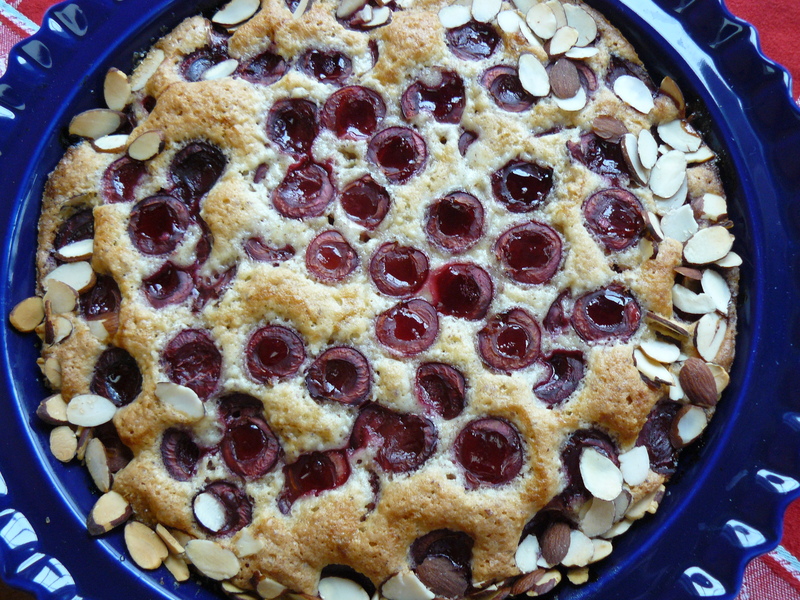 That’s OK, we can bake this moist and delicious cherry almond cake instead. 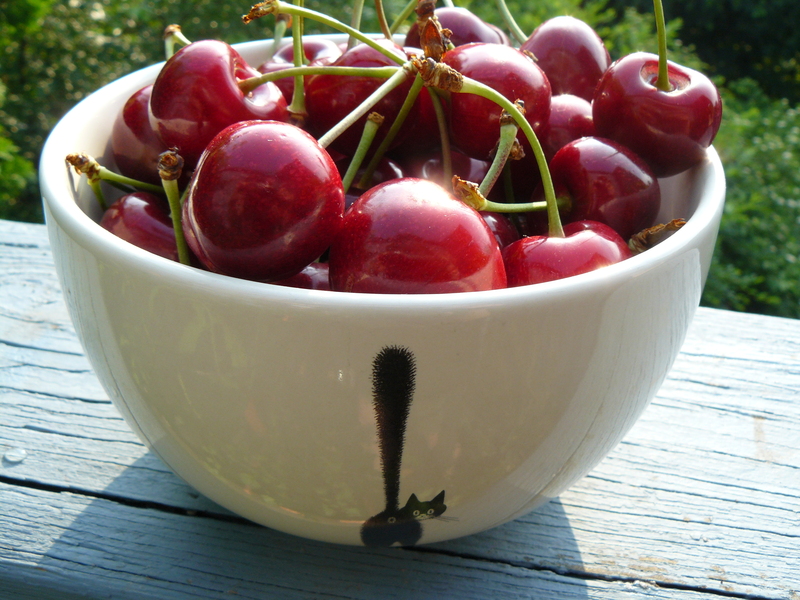 Life's a katty bowl of cherries! As anyone who knows me realizes, I pick to bake–ALWAYS. If you’re an almond lover–and I absolutely am–this cake has your name written all over it. Using a mini food processor, add 3/4 cup almonds, flour, baking powder and salt. Process until almonds are finely ground. Set aside. Use your stand mixer to cream butter with sugar. Add eggs one by one, blending each one till fully incorporated. Add almond extract. Spread batter evenly into buttered pie plate. 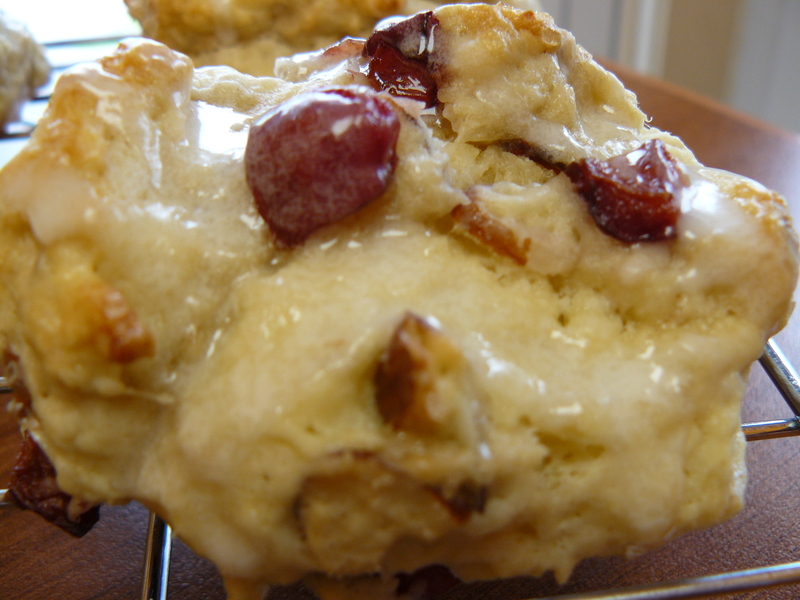 Place cherries atop batter. Mix together remaining 1/4 cup of almonds with 1 teaspoon turbinado sugar–sprinkle around edges of cake. 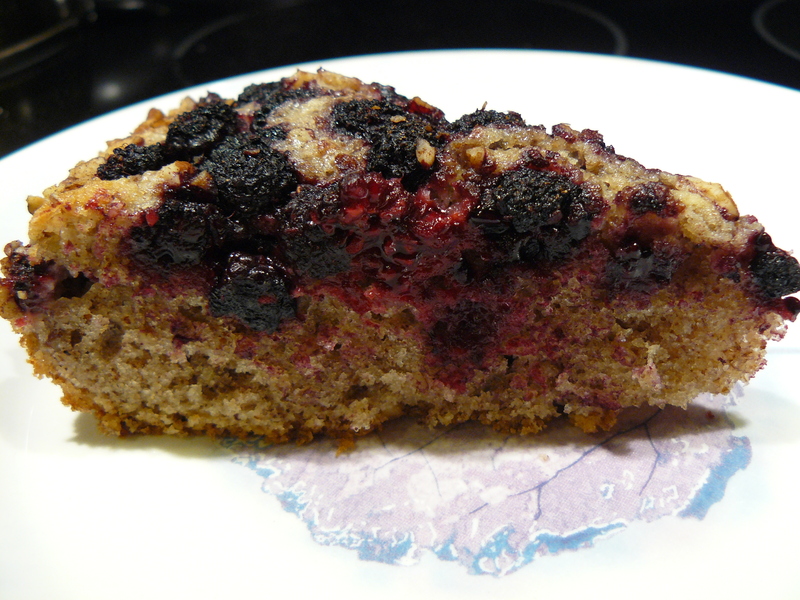 Bake until a toothpick inserted in the center of cake comes out clean, 45 to 50 minutes. Cool on wire rack. Tastes fantastic warm. Dig in! I woke up this morning to a very pleasant surprise on my blog: my friend Patty of Patty’s Food had let me know she had a blog award for me to pick up on her page. My first award! I’m not just one hand clapping in the blogosphere. What fun! Back in February, I started this little online portfolio of my kitchen adventures. After all, it could be a kick to see who’d follow along. At first, I thought it might be more of an exercise in talking to myself, but then, one by one, my friends showed up. And it felt so good to see you here! Enough about me! 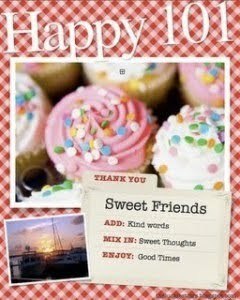 I’d like to share the Happy 101 award with 10 food bloggers who inspire me in the kitchen. The recipe on the award summarizes perfectly how I feel about cooking and baking and blogging–especially with folks like you! List who gave the award to you and use a link to her/his blog. Pass the awards on to 10 other bloggers* and let them know about their awards…except for Silvia and Patty–and anyone else previously nominated–you get a pass on this step! 1. 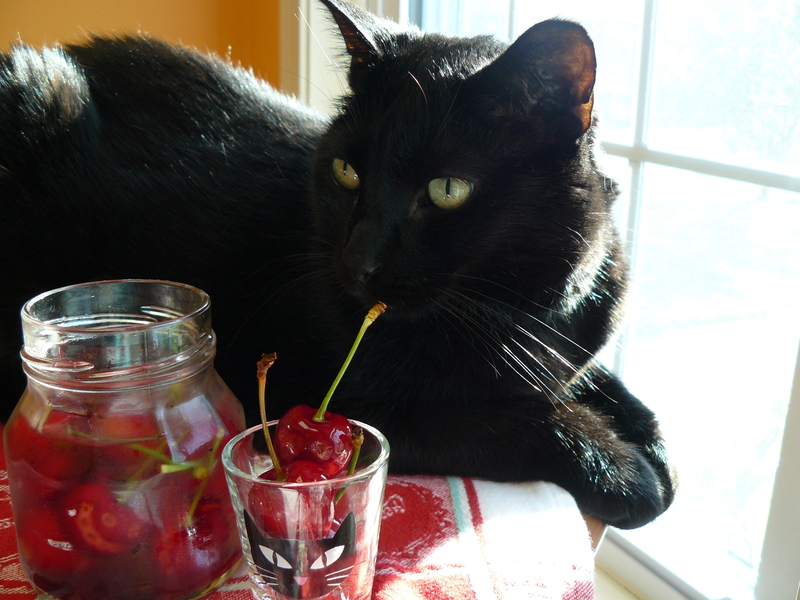 My fabulous feline companion, April Katt, who makes me smile in and out of our kitchen! 2. My wonderful mom, for more reasons than I could possibly list…ever! 3. Good times with good friends, near and far. 4. Developing new recipes and sharing old favorites. 5. Road trips in search of deliciousness. 6. Going for walks–especially at the shore. 7. Seeing redwing blackbirds and “my heron” who splits his time among local ponds in my neighborhood. 8. Driving on a sunny day with the sunroof open and my favorite songs blasting on the stereo. 9. Skating at Hammonasset State Park in Madison. 10. Cooking and baking for friends and family…of course! And now, drumroll please…10 bloggers who inspire me! 1. Patty at Patty’s Food – have you seen her Sage and Goat Cheese Cornbread? 2. Kristin the Norfolk Cooking Examiner – her almond squares rock my world–and she originally hails from the Land of Steady Habits as well! 3. 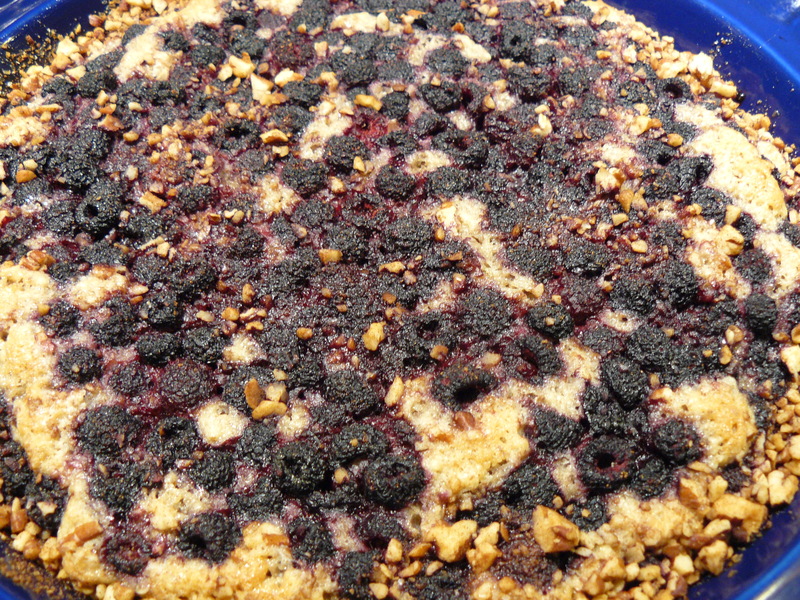 Christina at Culinspiration – try her key lime tart or rhubarb custard cake! Try not wanting to bake after you visit her site, loaded with tempting photos! 5. Rick at Bittersweet – because he makes me laugh out loud and comes up with some highly inventive goodies: Nyquil Night Tremor Molten Lava Cake?! 6. Tania at Dulcis in Furno – how can you resist these adorable pig brioches? 7. Cristina at Teenie Cakes – her photos give me camera envy–and her chai spice sugar cookies inspired me to make my own chai spice! 8. Silvia at Citron & Vanille – more camera envy, more deliciousness than I can manage, and my recipe box is filled with your gorgeous creations! 9. Claudia at What’s Cookin’ Italian Style Cuisine – not only for your recipes and lovely outside photos, but for encouraging me when I was brand-new! 10. For those who never even knew what a blog was, but would’ve had killer content: Nanny, Aunt Pegi, Uncle Al–you taught me so much. And I miss you! So, to all my friends and family (Ma and Al), thanks so much for your encouragement–as well as everything I’ve learned from you. I hope to enjoy our culinary journey together for a long time to come! Katty >>^..^<< and April Katt, too! P.S. 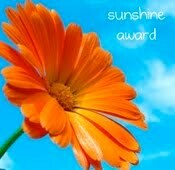 Oooooooh, this just in–my buddy The Baking Barrister has given me the Sunshine Award. It’s a banner week in Katty’s Kitchen! Thank you so very kindly, BB! It is hot as you-know-where here in the Land of Steady Habits, so, in an attempt to beat the heat, I headed to the shore yesterday. That didn’t work so swimmingly, but while in Old Saybrook, I stopped in at Fromage on Route 1 to buy some new treats for Katty’s Kitchen: hazelnut oil and champagne vinegar. How did no one clue me in sooner about such deliciousness?! Inspired by my Foodbuzz friend PachecoPatty and her very tempting Grilled Chicken with Herbs and Arugula Salad with Raspberries, I knew I could really beat the heat by making a salad with these fine ingredients, some tasty goat ricotta salata (yum!) along with some prosciuttini and sopressata from Public Market. 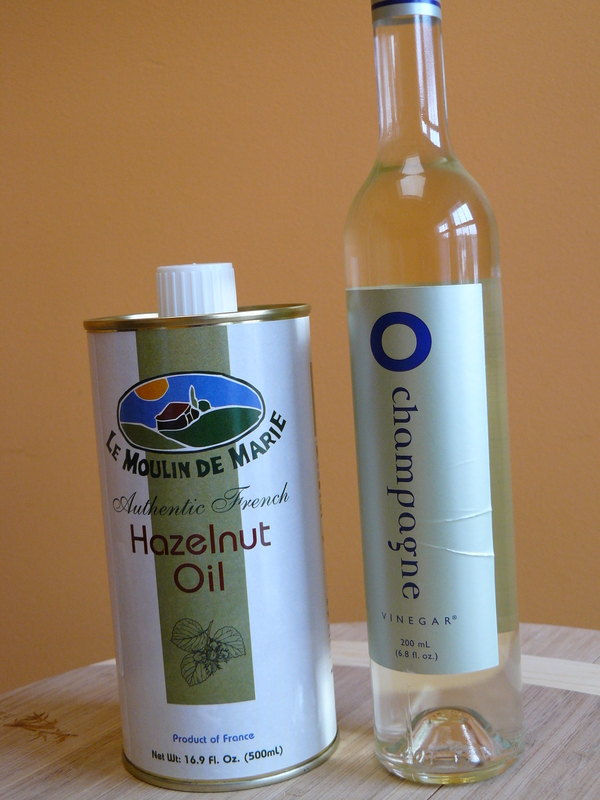 I found a lovely champagne vinaigrette recipe from Southern Living and simply swapped out the olive oil for hazelnut oil. I also didn’t measure nearly that much salt–just a series of grinds from the salt mill to taste. 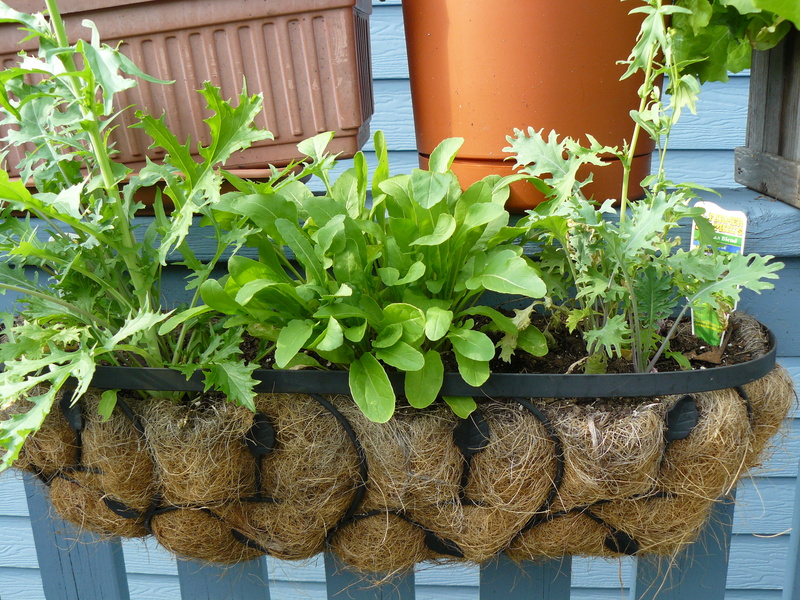 lime basil–if you don’t have some in your herb garden, please add to your shopping list immediamente! 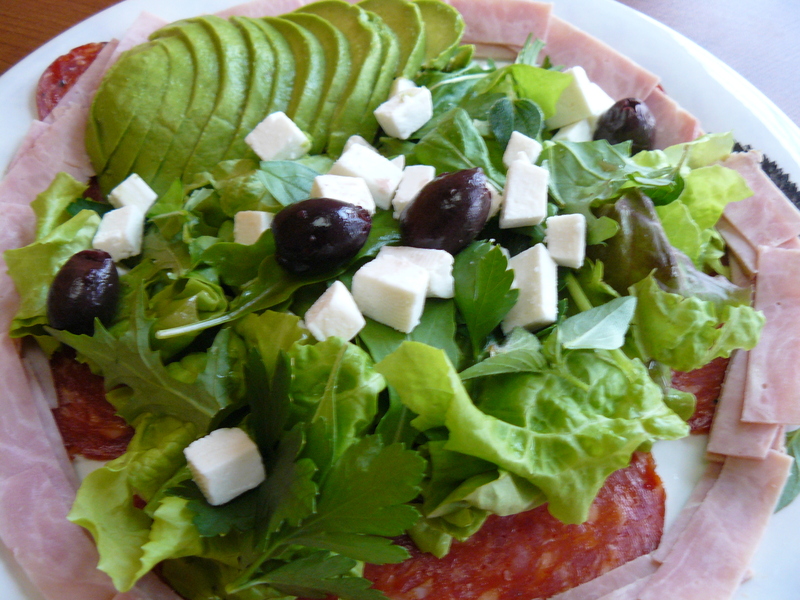 Growing up in an Italian restaurant, we always made antipastos and chef’s salads semi-artistically; thus my little ring of prosciuttini atop the sopressata around the perimeter of the plate. Please tell me you know about prosciuttini–peppered ham. My very favorite, both in salads and in Italian combos. 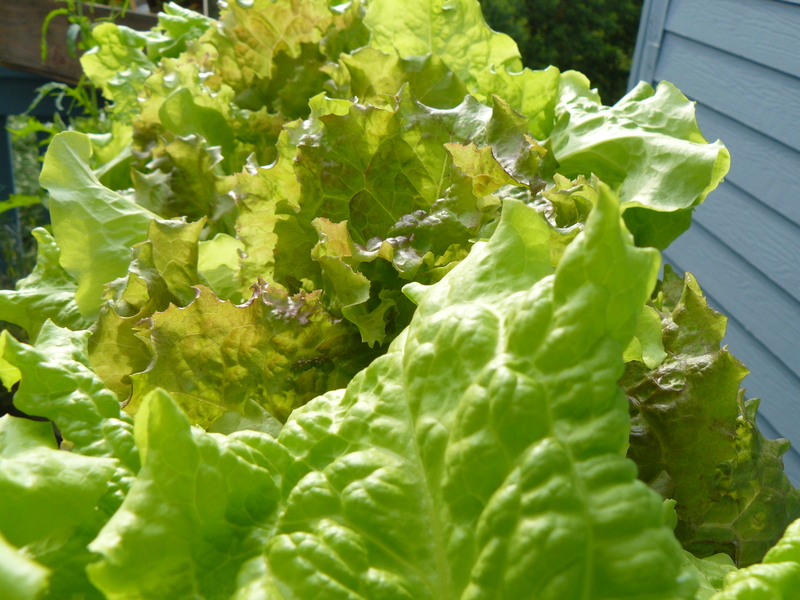 Nothing beats a freshly picked salad on a hot, hot day. In fact, I might need to have one right now! Ciao!